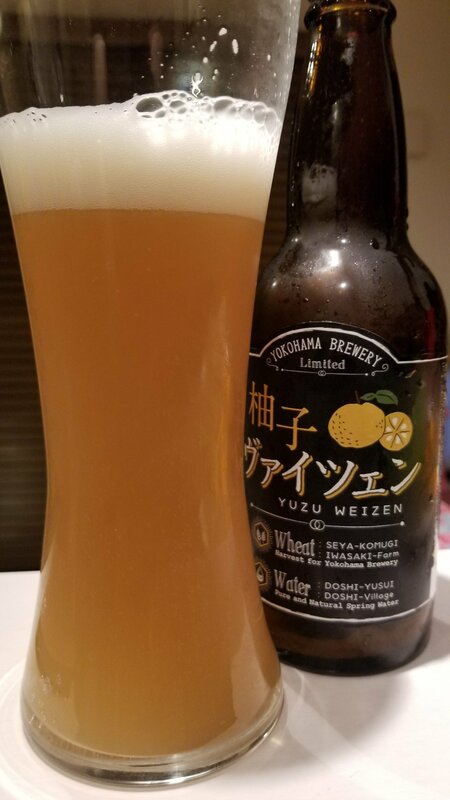 Yokohama Yuzu Weizen is a 5% fruit beer from Yokohama Brewery, based in Kanagawa, Japan. It’s part of their limited fruit series of beers and was first on sale in December 2017. It is brewed using locally sourced wheat from Seya ward in Yokohama, water from Doshi village, and also locally sourced yuzu, also known as Japanese citron, from Kanagawa. Yokohama Yuzu Weizen poured out a hazy dull golden straw colour with a fair amount of fluffy white head on top. The head clung to the side of the glass throughout drinking, only abating when the beer was almost done. There was a strong zesty yuzu coming off of the beer, along with some bananas, wheat, and a faint nose of cloves too. There was a lot going on when it was cold but damn, it smelt good when warmed up. Drinking weizens in winter seems a bit weird. Surely something bolder and stronger is needed but Yokohama Yuzu Weizen had just the right edge. Yuzu. Yuzu are commonly used in baths in winter in Japan. While I didn’t feel like I was having a bath, the yuzu brought something warming too Yokohama Yuzu Weizen. The body was quite thick, and also had a wheaty backbone to it. There was a faint yeasty flavour of bananas and cloves to it as well that lingered but the yuzu was the star here. I liked Yokohama Yuzu Weizen a lot – the yuzu and wheat flavours were great. Give me more!